On January 20, 2009, legendary “Queen of Soul” Aretha Franklin sang “My Country, ‘Tis of Thee” at Barack Obama’s first inauguration, with a hat that became just as memorable as the performance. 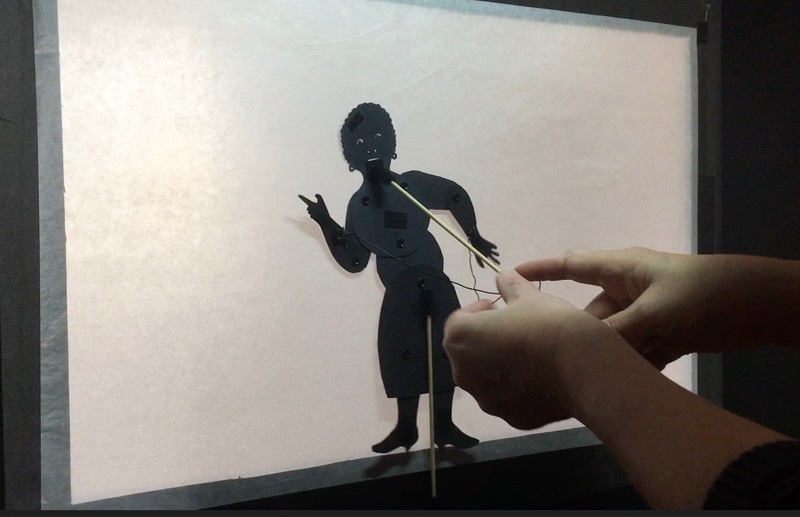 Ten years later, I am using her image to show you how to make a shadow puppet that can sing and dance. To avoid having to cut eyes with irises you may just cut out the outline of the eyes, and cut two small 2 mm-wide cone-shaped pieces with a rounded top. Tape them to the back of the eyes with black painter’s tape to make them stick out in the sockets. Cut out a the small rectangle that is big enough to cover the open mouth and tape it underneath, just enough to leave a smile when the mouth is closed. Tape it to the neck on both sides with black painter’s tape, making sure that the rod faces the puppeteer. 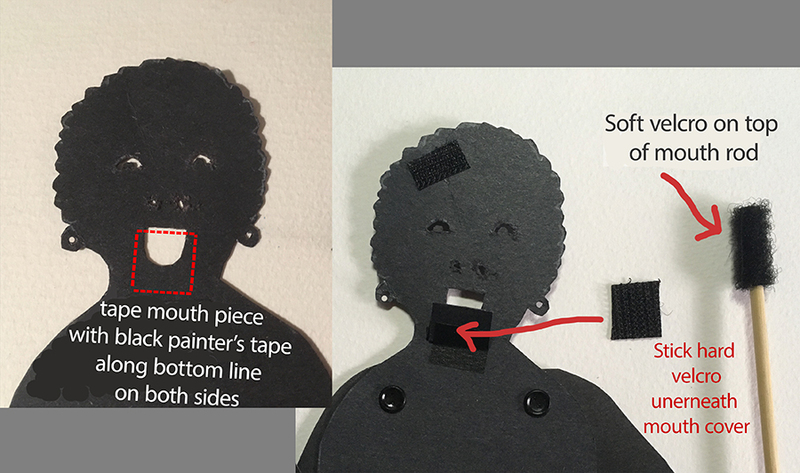 Attach a small piece of hard velcro underneath the moving mouth piece. Attach a piece of soft velcro to the top of a barbecue skewer and connect it loosely to the velcro underneath the mouth piece. 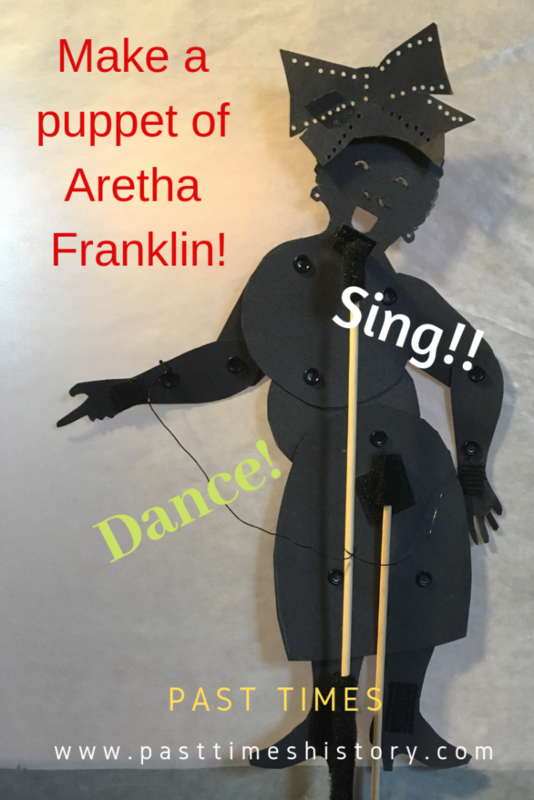 Use the mouth rod to move the piece up and down to close and open the mouth and make Aretha sing. Connect all body parts with small black brads as seen in the image below. Keep both arms and the tummy circle behind the bust and hips, which will make it easier for the puppet to shake her hips. Attach a piece of hard velcro to the stomach for the holding rod. Attach two metal brads to the wrists of the puppet and cut a piece of circa thin 13″ memory or craft wire. Wrap one end along the left hand wrist brad and twist the middle of the wire loosely, around the mouth rod (just once) in the middle of the memory wire. Now connect the other end of the wire to the right wrist brad. If you want to move legs and arms without using the memory wire, attach small pieces of velcro (the hard side) to hands and feet (shown in the photo). You can use a bbq stick as a moving rod when you wrap its top and bottom with soft velcro. 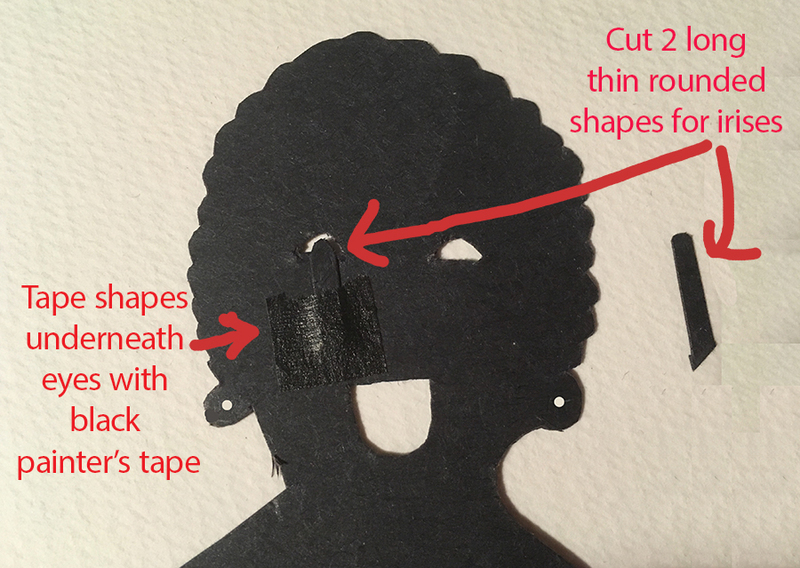 If you want to use the hat that Aretha Franklin wore during Obama’s first inauguration cut out the hat from the printable and trace on black paper. Carefully punch out little holes along the imaginary lines on the hat. Attach a small piece of hard velcro to the bottom part of the hat. Cut a similar sized piece of soft velcro and attach it to the hard velcro, then take off the paper on the sticky part. Now press the hat where you want the hat to sit on the head. You can take off the hat if you want to act out other songs than the one sung at the inauguration. 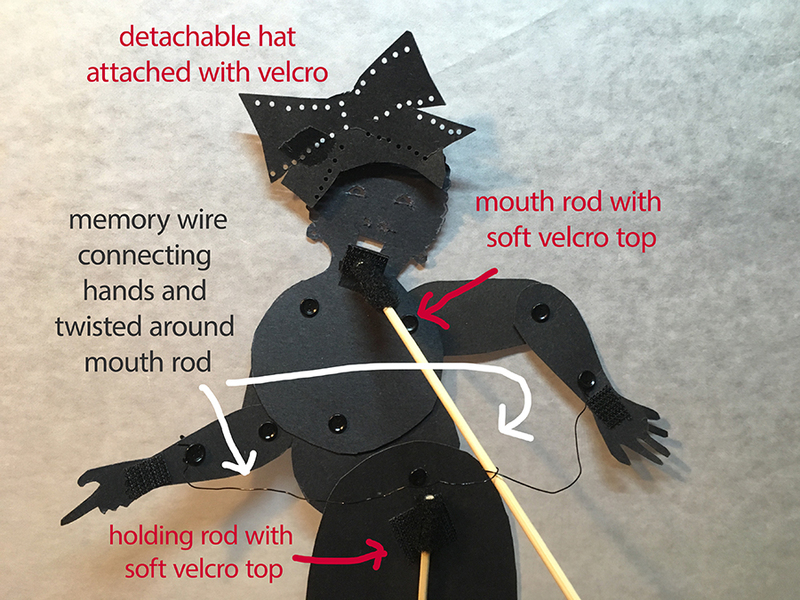 It is easiest to make your puppet sing and dance by attaching a holding rod to the stomach and sticking the soft velcro top to a 2″ wide strip of hard velcro underneath your shadow theater screen, which will leave both hands to maneuver the puppet (see instructions how to make a screen). Since both wrists are connected to the mouth rod through the wire they will already move a bit when you make Aretha sing. Move the mouth rod from left to right to make her dance. You can move the arms by moving the memory wire on both sides with one hand while holding the mouth rod with the other. Remember that the hand can only point one way if you want to keep the pointing fingers in the right place! Make sure you keep pressing the puppet to the screen with the mouth rod so that the puppet won’t flop backwards. 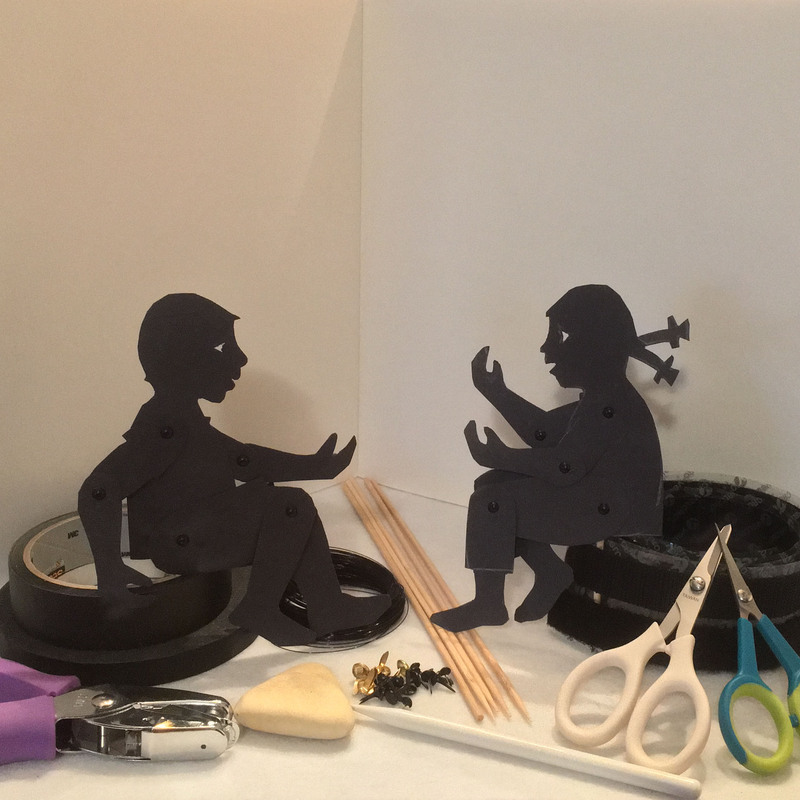 To download the template for the puppet go to our Printable Library and scroll down to “Music and Composers.” You can get access to the Printable Library by submitting your email address.